Since posting the Nook Touch Rooting Guide, I’ve received a lot of questions about the Android Market search not working, the buggy stock web browser, button savior, and various other details about getting started with a rooted Nook Touch. So that’s where this post and video tutorial comes in, where I’ll show you how to install a better web browser, the SearchMarket app for searching the Android Market, changing the layout and appearance of Button Savior, uninstalling apps, and a few other helpful details along the way. Once you have the Nook Touch rooted and the Android Market installed, one of the first things you’re going to want to do is install a better web browser. I’m using the Opera browser and it works quite well. There are two versions, Opera Mini and Opera Mobile. I don’t know what the differences are—either will work with the Nook Touch. Since the search function doesn’t work in the Android Market using this particular rooting method, you can install an app called SearchMarket that allows you to run searches in the Android Market with it. I’ve been told that another solution is to change out the vending.apk in the touchnooter image with this one to get an Android Market app with working search. I haven’t tried that method since I’m already using the method outlined below. Launch the Android Market from the Nook Touch. From the Market homepage, tap Apps, then tap the communication category, then hit the top free section. Use the Nook’s page buttons to scroll down to find the Opera web browsers and then choose one to install. If you have any trouble getting it to install, go open the “NookColor Tools” app in the app drawer, un-check “Allow Non-Market Apps” then make sure to re-check the box again. You have to un-check it then re-check it the first time to get it to allow the installation of third party apps. From the Nook Touch, open the Opera web browser. Type “searchmarket app” in the Google search box located in the upper right corner. Google will automatically show results for search market as two words so you have to select where it says “Search instead for searchmarket app”. Then the first listing will be for the SearchMarket app at AppBrain. That’s where you want to go. At AppBrain, tap the QR/more icon. Then scroll down a little and tap where it says install. It will re-direct to the SearchMarket listing in the actual Android Market to download and install. 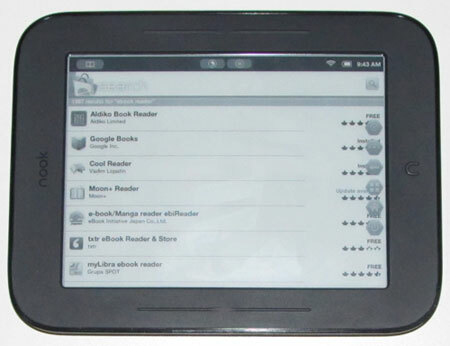 Once installed, it will appear in the Nook’s app drawer where you can use it to successfully run searches in the Android Market. Check out the video below for a visual demonstration of the above directions and for other tips and tricks for getting started with the rooted Nook Touch, including how to change the placement and appearance of Button Savior, how to uninstall apps, add widgets, and a few other things. Thank you for your video’s on the rooted Nook Touch. They have been of great help. #1 I thought I might mention that androidzoom.com can be used to search for apps and there is a link to take you to the market. #2 I completely agree that LauncherPro is a much cleaner Launcher on the Nook Touch, and the App drawer makes the Apps much easier to see. #3 I would highly recommend installing JuiceDefender. When widgets that refresh using WiFi (Facebook, Twitter, etc.) are running on the homescreens they can really chew up the Nooks battery life. With JuiceDefender the user can control which apps can access the WiFi and when they can use it. Thanks for the suggestions. Think I’m going to give JuiceDefender a go around. How did you get your buttons to work now? Also, thanks for showing how you get to the settings using Nook Color Tools, I was wondering how to get the Nook to allow third party apps, such as Amazon’s apps, but I couldn’t find the correct location where you could toggle that on and off… I think the Nook Color Tools is the trick. Buttons have always worked, just not with all apps. I wished they worked with Aldiko. You just have to go into an app like Aldiko that has a setting to switch orientation. Once you switch to landscape mode or portrait it will stay with other apps until you switch it back or open an app that doesn’t support landscape. and yes, i certainly did a clean dd backup FIRST! Is it possible to easily unroot the Touch & if so, how? Yes it is possible to unroot a Nook Touch. Here’s some info at XDA. There might be other options too. Got another question for you. In the photo at the top of this page, the STR is displaying the screen content in landscape mode. I thought the STR would only display information in portrait mode. Is the landscape mode an additional feature of rooting it? Yeah, apps that have the manual setting to switch to landscape work, and if they don’t have the manual setting like the Search shown above, you can get landscape by switching it in a different app and it will stay until you switch it back or go to an app that doesn’t support landscape. Got a question, how can I enable the page turn to function as scroll? 1:39 of your video shows you can scroll but mine cannot. I don’t know it just works by default. It doesn’t work with Market Search though. I have the same issue. Just rooted and cannot use buttons to scroll in Android Market, but page turn buttons work for scrolling in Gmail. Nooter did not add Amazon market, so I might have to just side-load that, but I’m also wondering why I can’t scroll in the market. Thanks for your efforts. All your videos and instructions are really easy to understand and after following the exact path now almost everything working properly. Please keep us informed about updates. Thanks again. Does anyone know how to uninstall some apps installed with the system and delet the two guidance books come with the nook? System apps don’t usually let you uninstall them. The books can be deleted by plugging it into your computer via USB and using the computer to delete them. That’s one thing I can’t believe B&N doesn’t let users do, delete ebooks directly from the Nook. regarding the Nook guidance books: i thought that logging into BN’s site and checking my personal library that i’d be able to delete the book – but apparently, they are ROM’d on the Nook? Can you root the Nook Touch even if it is not yet registered? Out of the box? I’m not positive but I think it does need to be registered, it does for this particular method at least. I guess people outside the US setup accounts with US addresses. I’ve been following the procedures and comments to root the Nook STR here and am about ready to purchase one. I however have a need that I must confirm can be done on a rooted STR before proceeding with the purchase/root. I have a large quantity of PDF publications that I use for my work. The pages of these original books have been simply scanned (no OCR) to create a PDF. So you could think of the content consisting of a picture of each page within the book that has been glued together into a PDF. When I view these PDFs on a Kindle, the full page is displayed on the screen and the font size displayed is probably 4 point font, if that. It’s impossible to read and it isn’t possible to increase the font size by pinch/zoom. I can do that on a rooted Nook Color or on an iPad. If the page content of my PDFs cannot be increased or reduced on a rooted STR, I’m not interested in purchasing it and going through the root process. Can I use some of the Android PDF apps, say Adobe Android Reader app, to zoom in/out on the page content, just like you can do with Adobe Reader on the Windows platform? If so, this takes me to my second question. If I use Adobe to zoom in on the page content, then on the rooted STR, can I slide the screen around the page to view those parts of the page which are outside of the viewing area of the STR screen? I have just the page for you. Here’s the Nook Touch PDF review. Adobe Reader doesn’t work but ezPDF Reader works pretty well if you are willing to put up with lots of screen refreshes. Thanks Nathan. I’ve watched your video three times, paying particular attention to ezPDF Reader. Based upon your review it looks like a great app. What I’m uncertain of is if the PDFs that I have can do text reflow. How can I find out? One of the books I purchased was acquired through Google Books (the only seller for that particular publication). All that Google did to create the electronic version of this book was to scan the pages, so that the pages appear as they would in the printed book. Also, there are times when I will scan magazine articles. How can I tell if those PDFs can do text reflow? I agree with what wiilie said. Tablets really are the way to go for PDFs, much more functional than any E Ink ereaders. You could test out re-flow on your computer using some free ereader software like the Sony Reader program to see how well it turns out, but since they are scanned it probably won’t work that well. reading pdfs on this ereader is pushing the envelope, but what do you expect for a low-power, sub-US$150 reader? Thank you Nathan & Willie for your comments. I like the STR because of its size, E Ink, long battery life. It’s difficult to walk away because of the PDF issue we’ve been discussing. I need to rethink my needs. I’m struggling with the idea of buying a tablet which will have a short battery life and the only functionality it provides over the STR is PDF capability. I might just keep the PDFs on my notebook and pursue rooting the STR so that I can get my Kindle & Nook libraries on a single, thin, device. Again, thanks for your guidance. My brother rooted the nook touch and he has filled in his email adres in youtube.. I can add my email adress only i can’t delete his email adres.. is there a other way for it? The problem now is that when i open the marketplace i see my brothers email adress.. I cant change this.. Do you have a solution? You should be able to go to settings, then accounts & sync to remove your brother’s accont. Thanks a lot for all the help though, all this is great! How do you get back to the Android home after going to the settings screen? Gotta use the softkey buttons. The icon is on the right side of the screen by default. After rooting, It seems going to Settings-> Social -> Link to Facebook, Twitter, Google doesnt work anymore. Any workaround for this? I never use that feature so I don’t know. You might try searching on XDA for a fix. Found that the stock shop feature also doesn’t work after rooting. It crashes after showing the first page. Do you experience the same on your Nook Touch? Yes, that’s a known issue. I showed it in the first rooted video. You can still backdoor your way into the store to shop for ebooks. Rooting doesn’t appear to have much affect on battery life, plus I usually keep Wi-Fi turned off unless I’m using it. So yeah, the battery is going to last a long time. Any chance there will be a Micro SD card folks can purchase that will root the nook like with the Nook Color for folks who are not tech savy? None so far, but N2A, the makers of the Nook Color cards, said that’s a possibility in the near future. A server error has occurred. Retry or cancel and return to the previous screen. What can i do to fix this, gmail is working so there is no problem with the internet access. Rebooting usually fixes issues like that. I suggest “Orientation Control” for manual orientation switch. The orientation applies to started apps. So it is really useful. Back on July 30th (above), I asked questions about reading PDFs on a rooted STR. I appreciate all of the advice and comments. Since then I’ve reevaluated my needs & have concluded that I will maintain PDFs on my notebook but I really want a device that will allow me to read my (non-PDF) ebooks from multiple sources, primarily BN & Amazon. As a result I went out and purchased an STR which takes me to my questions. 1) Before initiating the rooting process, should I register the STR with BN? 2) I’m under the impression from my readings on this site that even though the STR has been successfully rooted, there are continuous fixes which are presented on this site. With that in mind, should I follow the Nook Touch Routing Guide at http://www.the-ebook-reader.com/nook-touch-root.html or is there a more updated set of instructions which combines all of these fixes? If so, where can the updated instructions be found? 3) From the statement at the top of this web page, there is reference to the fact that the Android Market search function doesn’t work but if the vending.apk in the touchnooter image is changed out to “this one” (link), then the Android Market search will work. Has anyone does this successfully? 4) I’ve built numerous Windows based desktops from components successfully but I’ve never dealt with Android or rooted a device. What do I really need to do in Item #3 to be successful? 5) If you have any other suggestions for me as an Android newbie, I’d appreciate you sharing them with me. #2. This market fix is the only change. XDA maybe have different directions. Once I figured it out I don’t look anymore. #5. Rooting is a piece of cake; don’t sweat it :). Is there anyway to increase the screen contrast? Am I the only one who things it looks extremely faded after rooting? joe – there’s no way to adjust screen contrast *before* rooting, so no – it’s the ‘theme’ and ‘colors’ used on the e-ink display (which is unlike TFT LCDs, etc.) … my advice? don’t mess w/the default display after ‘upgrading’! and got to the point of copying the Touchnooter-1-6-24.img onto my 1Gb microSD card. (I had made certain that there weren’t any other files on the 1Gb card before proceeding.) With the IMG copied onto the card, I inserted the card into the STR, heard it click in place. I then powered up the STR. The screen displayed “Read Forever” not “Rooted Forever” and the STR eventually displayed the normal B&N STR page. After unzipping, the Touchnooter-1-6-24.img file is 120,488Kb in size, an IMG file, modified 6/24/11 12:41pm. I then got a 2Gb card, formatted it and copied the IMG over. I inserted microSD into the SRT, heard it click in place and powered up the STR. Same results. Perhaps it needs to be factory reset first so that it is on original firmware? I’ve heard the “Rooted Forever” doesn’t always show up for everyone, so that’s nothing to worry about. If I do a factory reset, do I have then get the STR associated with my BN account first or immediately put in the SD card? Setup your B&N account first. Nathan, I’ve gone through the factory reset/deregister. The STR rebooted & I signed into my account. I then inserted the SD card with the IMG on it and powered up the STR. The screen displayed “Read Forever” not “Rooted Forever” and the STR eventually displayed the normal B&N STR page, allowing me to view the books in my account. What program did you use to write the image to the sd card? Hi and thanks for the instructions. My Nook Touch gives an error about once an hour (network blah blah cannot resolve blah blah http://www.google.com) while the wifi is off and I am reading a book. It stays for about a second and then disappears. Is there a cure? In addition I would like to ask how to disable/remove gmail? Should I re-root with a different gmail account, or is there an easier way? I used WinRAR to unzip TouchNooter-1-6-24 which created Touchnooter-1-6-24.img which (in the Windows XP environment), I simply “copied and pasted” onto the microSD card. When I compared the file size & file type of Touchnooter-1-6-24.img on my (source) hard disk against the file that was copied onto the microSD card, they were the same. In the instructions, the “write” is used. I interpret that to imply get a copy, move or write the IMG file onto the microSD. Is that not the case? You have to write the image to the SD card using either of the image writing softwares described in the directions. Global Positioning System? (Why? How?) But since you are not getting it, it must be one of the apps that I have installed. I will investigate. I want to restrict access to my personal e-mails. I suppose I could change the gmail password (without letting nook know) and see what happens. If we’re going to root our Nook Touch, wouldn’t most of us like to back it up first? How can we integrate that with your tutorial on rooting? The instructions I’ve seen for backing up a Nook Touch (http://forum.xda-developers.com/showthread.php?t=1142983) involve rooting it a different way. So how do *you* recommend backing it up? Good point. I’ll do a post for restoring the Nook Touch as soon as I get time. Just follow those directions you referenced above. That doesn’t change the method for rooting. Or you can use this method to restore the Nook Touch if already rooted. If I update the firmware 1.0.1 with this method from B&N web (http://www.barnesandnoble.com/u/nook-support-software-updates/379002493/), the Nook get back to original firmware or still rooted? To install the update you first have to restore the Nook to its original state, then install the update, and then re-root. The update won’t install on the rooted Nook. Sorry if i missed it but how do i access the store for book purchase? you mentioned a backdoor… how do i do that? I don’t remember. I had some trouble with the shop home closing a long time ago, but everything has worked like normal for a long time now. You having problems getting the shop to work? Glad to follow your rooting instruction, works great for me, thank’s for that. Just how to make it b/w or greyscale appearance since everything seems to be the nook COLOR way. Not very nice and clear in e-ink screen. Well, since this site doesn’t use threaded comments, I will just put everything into one message – or at least however much will fit. @John w/ PDF issues. You can tell if a .PDF file will “reflow” in any PDF reading software simply by attempting to select text from within the regular Adobe Acrobat reader. If you cannot select text then there is no background text and thus no text to reflow. As you stated, most of the .PDF files you are reading are “image only” which, by definition, has no text to reflow. However, there are several means to get text in there, so to speak. I use Acrobat Pro to do OCR on the documents. Most OCR programs also accept .PDF files as input and can then generate either a text file or a .PDF file with the background text embedded. You can contact me through my blog http://www.ideationizing.com for further discussion. One way in which you could further distinguish your helpful site, and make it all the more helpful, would be to provide better explanations for some of the terms and technologies used in the rooting process. For instance: I have been able to surmise that the rooting process described by the Nook Devs web site involves booting off of a microSD card that has had a boot image “imaged” onto it, then manually replacing a specific file on the Nook Touch, which then allows root access. Nowhere in any of the instructions that I have read is it explained that this “noogie” essentially boots to it’s own stripped down OS which then allows direct access to the file system on the device. Everybody just lists the steps to “get ‘er done” instead of explaining how or why. Well, this “noogie” image seems like a pretty powerful tool that someone who intends to root their Nook Touch would want to know about and keep handy on a spare microSD card. So, Nathan, is there any way you could write a few articles explaining these very helpful technologies which are being used to root the Nook Touch – and/or other e-readers? Does anyone know if the GO Launcher EX app launcher is actually needed for a rooted Nook Touch? I kind of don’t like it and would prefer to just go back to the regular Android home screen. If we do absolutely NEED GO Launcher EX, is that so there can be an actual app that the Button Savior can start? Would there be some way to get the Button Savior to just go straight to the standard Android home screen? Thank you Nathan! I followed your instructions and everything went fine. I loaded Fbreader and some other applications. After while browser stopped working (both default and Opera). Any time I am trying to enter text for search, browser crashes. All other applications seem to work fine. Any ideas? I would try re-installing Opera or trying a different one like Dolphin. The regular browser always does that. Just found your site. I’ve rooted my NST (1.1) with salsicha 0.4. Everything went smoothly. I’m having trouble with the Opera mobile and the default browser; both don’t work (when selected, I get taken back to the home screen), and in the market, I can’t page up or down once I get into Apps -> Communication – >Top Free (pressing the nook buttons does nothing), so I cannot get to the Opera Mini app to try a reinstall. Any suggestions? The market works fine with salsicha 0.4 on mine. I can run searches and scroll using the page buttons. It doesn’t have the problems the old method had that referred to this post so I don’t know what the problem could be. I also has this feeling after rooting the 1.1. Do you also has this problem and how to solve it? Thanks. I cant access the launcher Ex anymore after I accidently clicked the nook home as the default home I can no longer go back to the Launcher Ex.Please help. Should have used button savior. You’ll probably have to re-root unless you can find a way to pull up one of the apps somehow. Been trying for hours to just get ezpdf on the nook, but no luck. Blocked at every turn. Read the rooting directions and you will be advised on the subject of creating a backup. I was able to root my NST and using your instructions now have a working market search so basically all is well. I also think the contrast is pretty terrible, less so for reading, and totally when I open the app drawer and try to see what apps are loaded. Is there any way to change the default picture behind the apps? Right now it’s a very dark picture. thanks. You can change the background like any other tablet. Long-press on the homescreen or change preferences in menu. My background it white so the contrast is great. It was the default theme for Salichinooter, ADW black on white or something. Hello Nathan. Thanks for all these that you provided! By the way, I had problems with Opera web browser on my rooted Nook touch. It kept crashing so it stopped me from getting searchmarket app (and I don’t really want to go through changing vending.apk thing hehe). It’s convenient to be able to just download and install apps on the spot but should someone out there gets stuck in a situation similar to mine, here’s a workaround. > Turn on Nook wifi. Go on to your computer, and log on to https://play.google.com/ with your Gmail account that you use for your devices… Choose an app then there’s an option there to send it wirelessly to your device. Hope this helps anyone. I also had problems with ebook readers bugging out. Now I am trying Cool Reader, which seems to be alright. For PDFs, BeamReader seems to work best but unfortunately it does not stick to landscape mode. PDF Reader at least will stay in landscape though it is slower and has some issues displaying PDFs with images instead of just plain text. (To change the orientation go to the desktop settings screen, More, then ADWSettings, and it’s in there somewhere.) Landscape makes reading PDFs easier. I would buy EZPdf but I can’t be sure that it would work so I am sticking to free readers. I also turned off the dock and put an icon for the app drawer on the main desktop. Trying to get the interface quite minimalist in general. Just some other tips from my brief experience. My NST is actually my first Android device. I pared down the desktop until it is just a white background with a 5×5 grid of “minimalist black” icons and the status bar. I turned off the gesture shortcuts and actually uninstalled Button Savior. Now it is very simple and clean. What I use instead of Button Savior is the tool “Processes” which is part of the the “ASTRO” file manager app. I get to this by long-pressing the Nook button, which brings up recently used apps. I always have “Processes” and “Rotation Lock” on this menu. This means I can kill any app which is expecting hard buttons, such as the IMDb app. You can put “Processes” on the desktop from inside ASTRO. For the Opera Mobile browser, many pages unfortunately force portrait orientation. If you have Rotation Lock in the recent apps menu though, you can force it back once the page has finished loading. My Nook ST was rooted yesterday (but not by me – I’m definitely out of my depth here!). It’s only taken me one day to make the rooted part go away. No gmail, no Opera, no drop box, just the eReader I had before. I have no idea how this happened, except that not knowing what I ought to press I was pressing this and that and I guess I pressed the wrong thing. Could it all still be there somewhere, and if so is there any way that I can get it back? Thank you, It worked great. Could you post an md5sum for the touchnooter file in the previous article? My download was bad and if I didn’t think of redownloading the file and comparing the md5sum, I would have thought my Nook was bricked. Actually, my download wasn’t bad, I accidentally compared the touchnooter.img file with the touchnooter.img.gz. I was able to restore it with the instructions in the article about backing up a nook. All the tips I find on the web are for nook touch with 1.1 firmware – anyone buying the nook now will have firmware of 1.2.0 or more so how can we root it?! I have tried several ways but they wont work with firmware 1.2 From what I read you have to have 1.1.0 Is there a way to downgrade my firmware to an older version? I have rooted my Nook Simple Touch OK. The problem I have is that having installed Kindle, I cannot get the text/fonts of the books in that library to change.I have carried this out OK with the books in My Library(Nook) and have achieved the increased size font I require but in Kindle, the text/font remains so small it is almost ineligible. I also changed the size of the font for the Nook itself OK but this still leaves Kindle unaltered.Can you help please? Can I use another stores in NST? for example, Aptoide, Mobile Market, etc? Install Android Market is a long process that need internet conection. Yeah, other app stores work but you’re going to need an internet connection just the same. help please… just rooted my 1.2.1 nook using XDA nook manager. Amazon appstore which is installed is claiming “still” not to work in my area (been 3 weeks), and I do not know where do I get the files from in order to sideload (never had an android before)… so I do not manage to get any reading apps of it (got it in order to annotate PDFs)… mmmm….. what am I doing wrong?